For the past three years, the Bank of England (the Bank) has carried out an annual ‘stress test’ of the UK’s largest banks. To do this, it designed a narrative-based stress scenario in 2014 and 2015. The goal was to determine the banking sector’s resilience to pertinent threats, like recessions or a sharp fall in house prices. However, changing scenarios each year makes it difficult to judge how banks’ overall vulnerability to risks changes over time. Since the crisis we learned that risks build in the good times and capital in the banking system should rise to reflect this. This is why – beginning this year – the Bank has also run an Annual Cyclical Scenario (ACS). Before I begin, first let me describe the key elements of what the Bank’s narrative-based and cyclical scenarios entail. Each stress scenario generally has a UK and international component for which Bank staff project the path of key variables over a 5-year horizon. The severity of these projections can be measured in several ways, such as calculating a variable’s low point during the scenario relative to its starting position or by observing its annual growth rate during the scenario. Importantly, each scenario will affect banks differently. This is because no two banks are the same, with no two banks possessing the same vulnerabilities to each region or variable. Now, back to the methods that the Bank has used to design stress scenarios. The orientation of the 2014 and 2015 scenarios was determined by the risks that the Bank’s Financial Policy Committee and Prudential Regulation Authority Board thought were significant. In 2014 the stress focused on risks relating to the UK household sector. In 2015 it focused on a pronounced slowdown in China, other emerging markets, and the euro-area periphery. These chosen risks drove the scenario, with other variables responding to them. Thus the overall scenario severity was derived from this process. Although these scenarios examined areas where risks were pertinent, the result was that some variable profiles changed materially as they moved in and out of focus between scenarios. 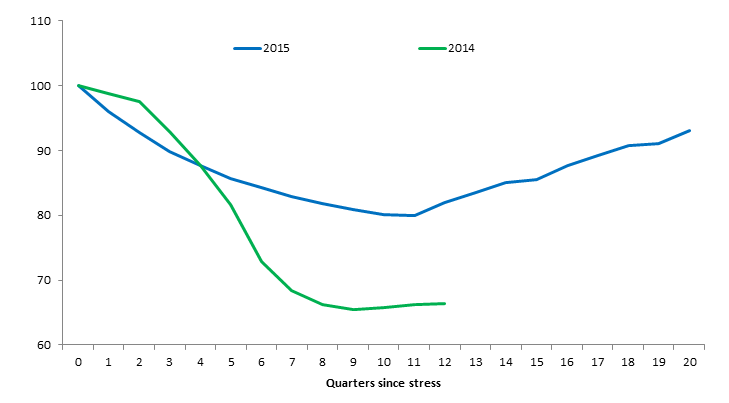 This can be seen when one compares the 2014 and 2015 house price stress profile, Chart 1. The variable severity, looking at the low point relative to the start of the scenario for the two stresses, changed significantly between the scenarios. 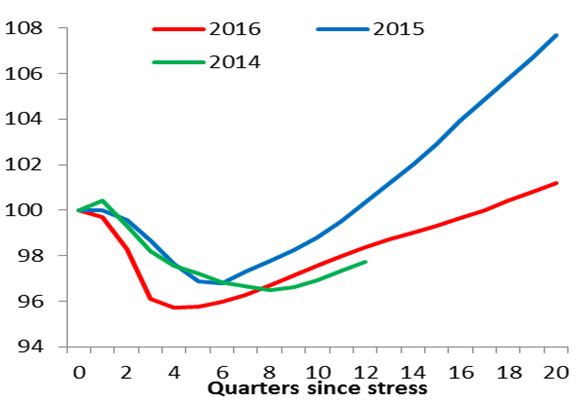 While a natural consequence of a narrative-based approach to stress testing, one might argue that house prices had continued to rise between these dates implying, all else equal, that their related risks had increased. Sources: Bank of England, Stress Scenarios. Thus a key challenge with a narrative-based approach was judging whether overall risk was rising or falling and hence whether bank capital needed to be higher or lower. With variable severity changing depending on the scope of the scenario, it meant the impact of the scenario on banks would change in a way that may not reflect the changing overall risk environment. Part of this was due to the nature of the stress event selected by the FPC and PRAB in a particular year. For example, UK banks tend to be less exposed to East Asia (2015 scenario) compared to the UK residential housing market (2014 scenario). The Bank’s Annual Cyclical Scenario (the ACS) framework was developed to overcome some of the challenges posed by relying on a narrative-based approach alone. Published in late 2015, this framework was used to design the Bank’s first cyclical scenario – the 2016 ACS. The key aspect of the ACS framework is that the scenario severity should be cyclical. This means that the scenario severity should vary through the financial cycle, to reflect the changing probability of a crisis occurring and impact should it occur. As risks increase, the scenario severity increases and the amount of capital needed by banks to withstand such a scenario should increase. This cyclical scenario will mean the stress test should be able to support counter-cyclical policy. That is capital in the banking system increases as risks increase. Because 2016 is the first year that the new ACS framework has been used to design the annual stress scenario there is nothing to directly compare its severity with. 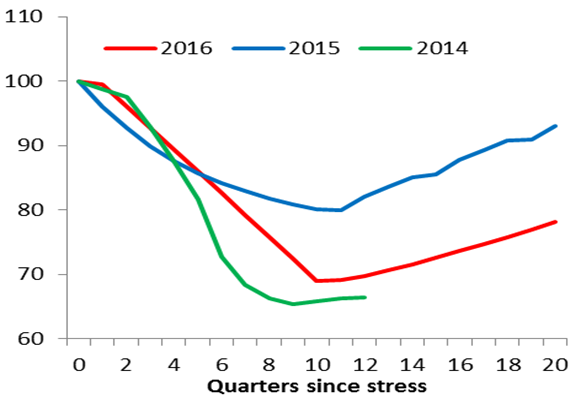 However, comparing severity over the Bank’s previous stress scenarios indicates that the UK component of the 2016 ACS is broadly as severe as the 2014 scenario. Charts 2 and 3 show that the 2016 scenario GDP low point is the most severe compared to the previous scenarios, albeit calibrated under a different method. The 2015 scenario’s house price severity is milder than that of 2014 but still quite severe compared to historic falls. Source: Bank of England, Stress Scenarios. However the true test of the cyclical nature of the ACS framework will come to the fore when the next ACS (the 2017 ACS) is published. This scenario should differ from its 2016 iteration depending on the Bank’s view of how risks have changed over the year. If scenario variables in the 2017 ACS were less severe (UK or global) it may indicate that the Bank thinks risks have reduced or crystallised. The opposite may be true if the 2017 ACS were more severe. The Bank may then want banks to be prepared for a more severe tail event. The annual cyclical framework’s goal to reflect the changing state of the financial cycle means the stress scenario must incorporate the latest developments to key macroeconomic variables in a coherent way. Compared to narrative-based scenarios, this means that it is much less likely that some variables’ severity will change materially unless risks relating to these variables change significantly. However, to properly do this requires the Bank to understand not only which risks are important today but which may be important in the future, and how best to combine them into an overall measure. This involves particularly thorny questions. Are soaring house prices a more important threat than a current account reversal? To properly evaluate these issues the Bank’s steep learning curve must continue. Colm Aodh Manning works in the Bank’s Stress Testing Strategy Division.